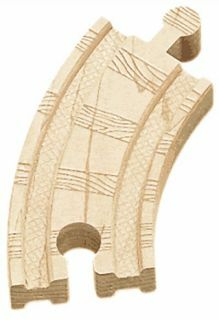 The Thomas & Friends Wooden Railway - 3.5" Curved Track has 4 pieces of the 3.5" curved tracks. Each has the track grooves on the top and bottom surfaces, so it can be turned over to curve to the other direction. Comparing with the 6.5" curved tracks, they give a sharper turn around a corner but it will take less space to bend around and this makes them very useful because space is never enough once you pass the beginning stage of layout into more sophisticated or crowded layout.